Michigan State University will pay its ex general counsel, Bob Young, $1 million to go away, after being fired last week by the new interim president. 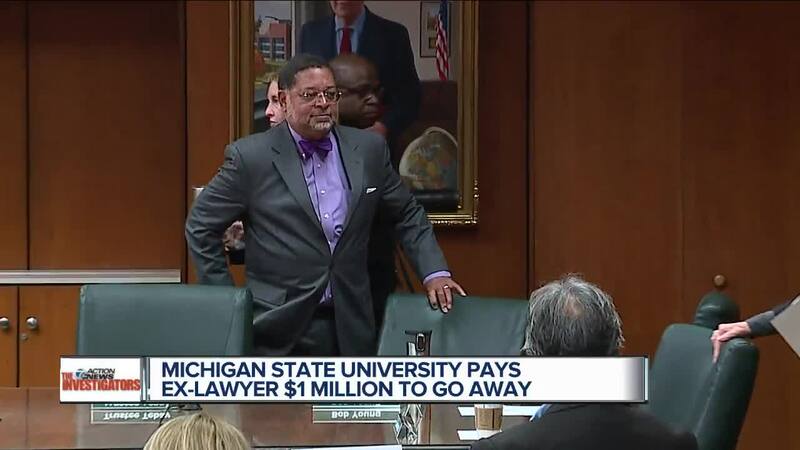 EAST LANSING (WXYZ) — Michigan State University will pay its former general counsel nearly $1 million simply to go away. A spokeswoman for the university confirmed to 7 Action News that Bob Young will receive $990,402 for the remainder of his three-year contract. Young worked at MSU for less than a year and was fired last week by acting president Satish Udpa. Brought in under interim president John Engler, his appointment was controversial from the start. Along with Engler, Young was criticized for treating survivors of Nassar's sexual abuse as adversaries during settlement negotiations. He was unpopular among trustees as well, with 3 of 8 voting against his hiring last year. In January, it was revealed that a scathing Department of Education report criticizing MSU for repeatedly failing to ensure safety on campus wasn't shared with trustees by Young. Instead, it sat in his office since December and wasn't revealed until January after ESPN obtained the report through a public records request. It's unclear if that played a role in Young's firing. In December, Young and MSU were accused by special prosecutor William Forsyth of obstructing the attorney general's investigation into who knew what about Nassar. Forsyth said MSU deliberately drowned his investigators with documents that were irrelevant to his probe and refused to waive attorney-client privilege, as Penn State did during in the aftermath of the Jerry Sandusky scandal. University spokeswoman Emily Guerrant said Udpa "wasn't happy" about paying out the remainder of Young's contract, but did not say why Young wasn't fired for cause. In a letter dated February 1, Udpa told Young: "We appreciate you stepping in last year during a time of transition."